In January 1990 Democrat Robert Garcia, as a result of his involvement in the infamous Wedtech scandal, resigned from his post as the representative for an NYC congressional district centered on the mostly-Hispanic South Bronx. With vocal support from key Democratic leaders—including Jesse Jackson, New York Mayor David Dinkins, and Bronx Borough President Fernando Ferrer—Serrano won Garcia’s vacated seat in a special March 1990 election and has held it ever since. A number of his political campaigns have been supported by the Democratic Socialists of America. In 1999 Serrano applauded President Bill Clinton‘s clemency offer to 16 incarcerated members of the FALN, a Marxist-Leninist terror group that had been active in the U.S. from the mid-1970s through the early 1980s, and whose overriding mission was to secure Puerto Rico’s political independence from the United States. Depicting the inmates in question as “political prisoners,” Serrano—along with such notables as Luis Gutierrez, Jesse Jackson, Coretta Scott King, Rigoberta Menchu, Desmond Tutu, and Nydia Velazquez—actively supported the the Pro-Human Rights Committee of Puerto Rico‘s campaign calling for the prisoners’ release. An open admirer of Fidel Castro, Serrano has praised Cuba’s former dictator as “a great leader for his people.” Denouncing the “backward and counterproductive policy of blockading and isolating the Cuban people,” the congressman has long advocated the normalization of American diplomatic relations with Havana. In July 2003, Serrano sent one of his staffers to Cuba “to examine U.S. policy toward Cuba, the impact of the American trade embargo, and the economy of Cuba.” The cost of the trip was covered by a grant from the Center for Democracy in the Americas, which has close ties to the Institute for Policy Studies. 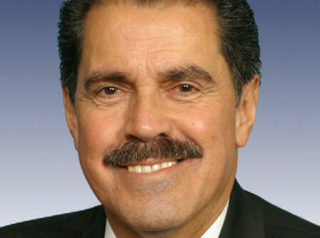 Serrano also favors increasing U.S. federal aid to his native Puerto Rico, which he describes as an American “colony.” He has repeatedly proposed legislation that would call for a referendum allowing Puerto Rico to declare either its independence from the U.S. or its wish to become America’s 51st state. For an overview of Serrano’s voting record on a variety of key issues, click here.